his has been a tradition for 83 years. Vadakkampatti, a small village in Thirumangalam taluk of Tamil Nadus Madurai district, hosts an unusual annual temple festival. Where else can you find biryani served as prasad? And, its not just for devotees; anyone who walks into Vadakkampatti on January 25 this year will be treated to a hearty meal of mutton biryani. The cynosure of the three-day festival is the humble Muniyandi Swami temple that stands in the middle of the village, where over 2,000 kilograms of rice and mutton are cooked in huge cauldrons overnight by tireless men. The biryani is cooked in 50 vessels on firewood stoves all through the night and offered to the deity at around 4 am, after which the first batch is served at 5 am,”says N Muniswaran, a member of the organising committee. Eating biryani for breakfast is a unique feature of the event and its served to everyone without any discrimination. You can see people cutting across all sections and age groups sitting for a meal or lining up with utensils for parcels. Its not just the people, but also Lord Muniyandi who is a fan of our biryani,beams Santhakumar, a local. Last year, we sacrificed about 200 goats and 250 roosters, making it to 1,800 kilograms of biryani. This time around, the quantity will be more. Almost everyone in Vadakkampatti is a biryani fan. This is where the popular restaurant chain of Madurai Sri Muniyandi Vilas has its roots. The name will ring a bell for anyone who lived in Tamil Nadu in the 70s and 80s. At a point of time, the chain is said to have had over 1,000 outlets across South India and was known for its range of spicy mutton dishes and, of course, the ubiquitous biryani. The first Muniyandi Vilas was started in Karaikudi by one SVS Subba Naidu from our village and his inspiration came from the festival, says Muniswaran. Later, his extended family and friends from Vadakkampatti and its surroundings started restaurants in the same name and the prefix Madurai was added to it,”recalls Muniswaran. 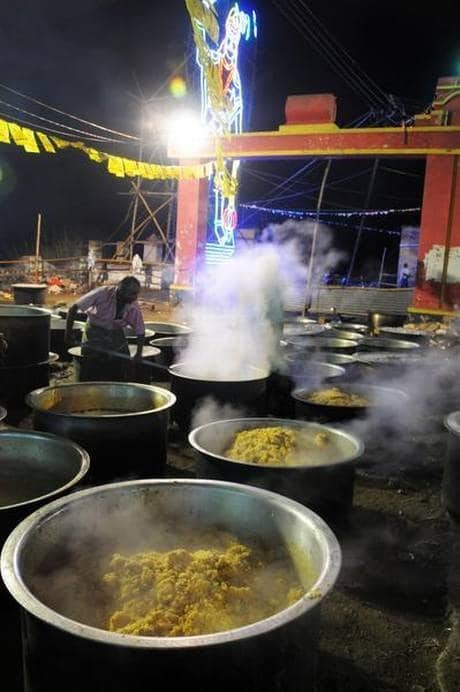 The Muniyandi temple biryani festival will be held from January 24 to 26 at Vadakkampatti, which is about 45 kilometres from Madurai city and 20 kilometres from Virudhunagar.